A full service equestrian center serving the rider through every stage of the horsemanship cycle from the first ride to top level horse show competitor. Built in 1982, Chagrin Valley Farms is located on 85 acres in Bainbridge Twp., Ohio. The facility includes 75,000-square-feet under roof including two heated indoor riding arenas. The Farm also has four outdoor rings, pastures, and trails. Purchased by the Schneider family in 2017, the Farm has undergone major renovations. 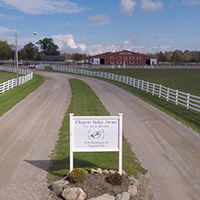 Chagrin Valley Farms has been instrumental in developing new horses and riders through riding lesson programs for all ages and abilities, summer camp programs for youth aged 4 to 16, and hosting horse shows for every level of competitor.